And I'm Chinese, which means I knooow the things to know about rice. I mean things pertaining to eating said rice. I know little else about rice, really. But apparently a lot of other people think cauliflower rice is pretty super too! I've read how Trader Joe's in the States had major shortages of their packaged frozen cauliflower rice across a handful of stores earlier this year, necessitating a two-bag daily limit per customer at one point. Fascinating! 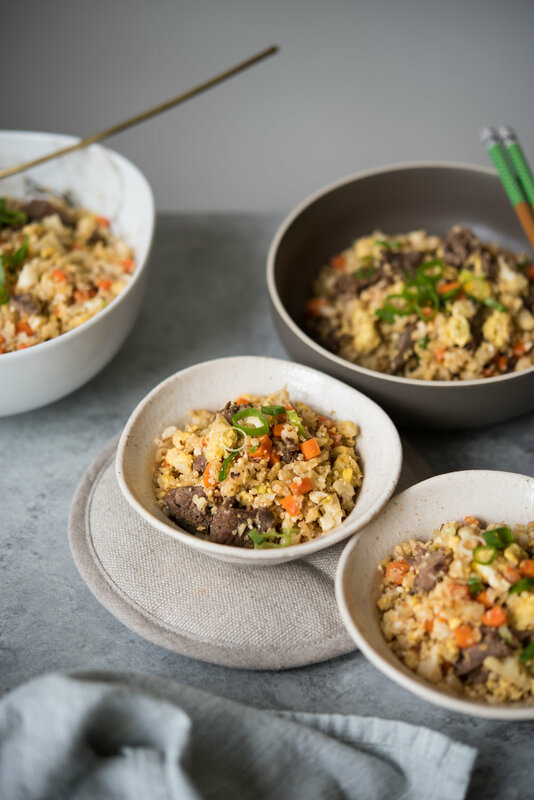 I have been making this particular cauliflower fried rice on heavy rotation for months. I wanted to blog it right away because I knew immediately it was a winning recipe. But somehow this dish was so gosh darn hard to photograph well, it took me a couple of misfires to get the photos to do the recipe justice. I'm SO excited it's finally here! Even if you don't have access to packaged cauliflower rice (I don't), it is easy peasy to make. Raw cauliflower florets are pulsed in a food processor until the pieces are similar to the size of cooked rice grains. Voila. 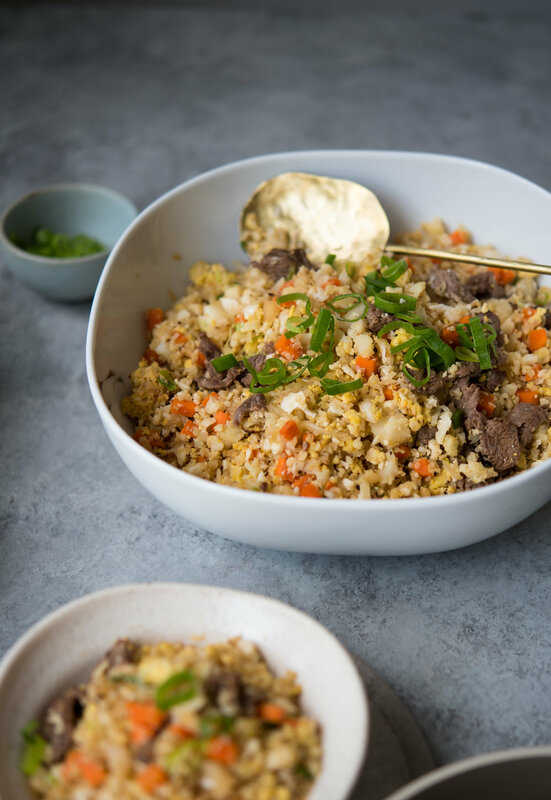 You have yourself cauliflower rice. Ready to be cooked and eaten in mere minutes (about 5 minutes, if you're keen to know). 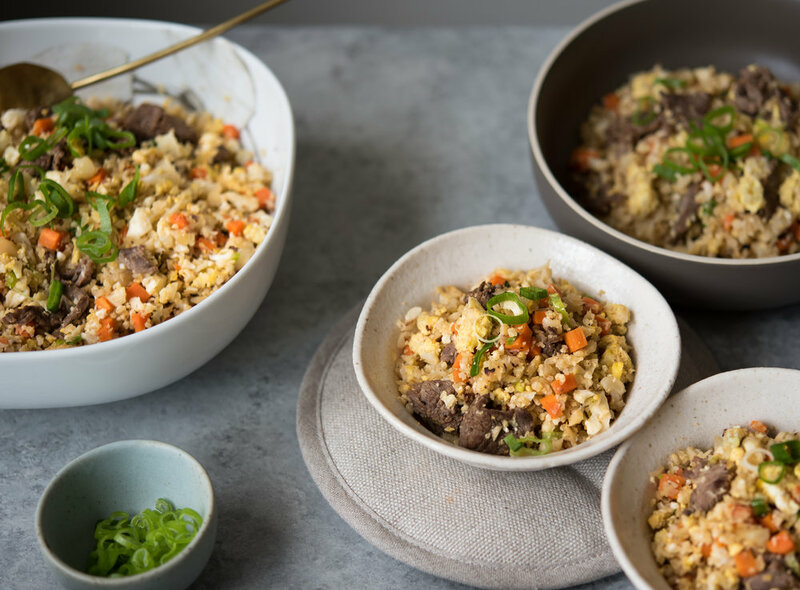 Now that you're convinced on the cauli rice, a brief word about the beef in this recipe. While you can omit it to keep this meal ovo-vegetarian, my family really really loves the savory bits of steak as a component. It adds a flavor dimension that makes this dish what it is. Whenever I use beef for stir-frys, my go-to cut is a well-marbled flatiron steak. If you can't get your hands on that, flank steak, bavette (aka flap steak) or other quality cuts of steak should work equally well. Do look for a piece with thin, even marbling (aka intramuscular fat) throughout to ensure juiciness and flavor. I believe in minimal beef consumption as a family so when we do eat it, I make sure it is the highest quality I can afford (from my local butcher) and I deliberately slice it super thin ~1/8" to stretch it farther. If the beef is top notch, a little goes a long way! MAKE IN ADVANCE: The cauliflower can be "riced" in advance. 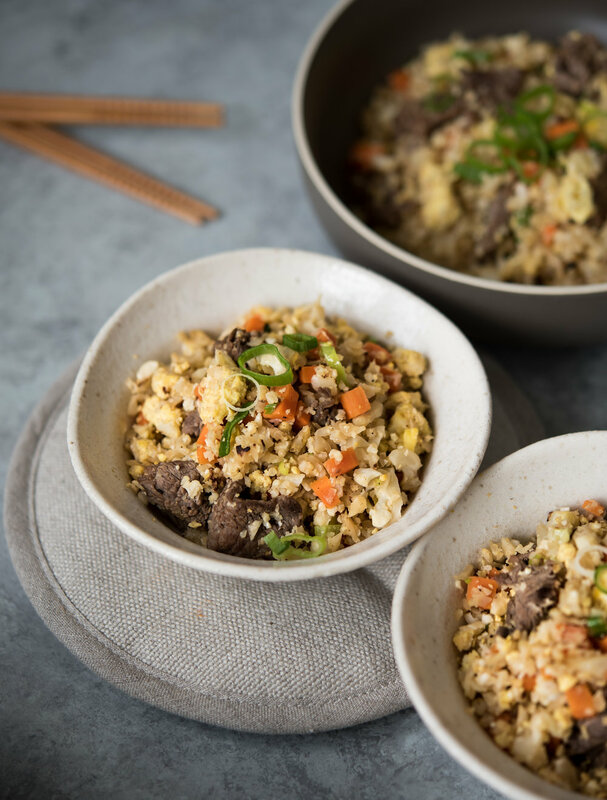 You can keep it in the fridge or if not using it within a day or two, freeze the cauliflower rice in a freezer safe container or zip-top bag with air pushed out until ready to use. Use directly from freezer. If your cauliflower is large, I suggest you can rice it all anyway and freeze the extras for another meal as a plain rice substitute. CAULIFLOWER RICE SHORT-CUT: Buy frozen bags of cauliflower rice from the freezer aisle. FLATIRON SUBSTITUTION: Whenever I use beef for stir-frys, my go-to cut is a well-marbled flatiron steak. If you can't get your hands on that, other quality cuts of steak should work equally well. Do look for a piece with thin, even marbling (aka intramuscular fat) throughout to ensure juiciness and flavor. PALEO VERSION: replace gluten-free tamari with coconut aminos plus an extra sprinkling of salt to match the slightly saltier taste of tamari. 3/4 lb flatiron steak (or any well-marbled steak), very thinly sliced to 1/8"
1. Combine the sliced steak and remaining marinade ingredients into a bowl. Mix well to ensure pieces are evenly coated and set aside to marinade 20 minutes up to overnight. If marinading more than 20 minutes, keep it covered in the fridge but bring to room temperature about 20-30 minutes prior to stir-frying. 2. Wash and cut cauliflower into small florets. This helps it "rice" more evenly in the food processor. Working in batches (fill about 2/3rd way up food processor bowl), pulse cauliflower florets until you get small pieces to size of cooked rice grains. For me this takes about 22-25 pulses. See images above for what it should look like. Put riced cauliflower into a large bowl and continue with the rest. If you don't have a food processor, I have heard people use grater to accomplish the same. To skip this step entirely, you may search for frozen cauliflower rice on Amazon, at Trader Joe's, etc. 3. Set out a bowl large enough to park all of the seared steak, cooked carrots and cooked eggs from subsequent steps 4, 5 and 6. A legit stir-fry is all about cooking each ingredient separately to their optimal texture before combining everything again in the final step! 4. Heat a large (I would say at least 10C capacity) heavy-bottomed saute pan, Dutch-oven or wok over medium-high heat. 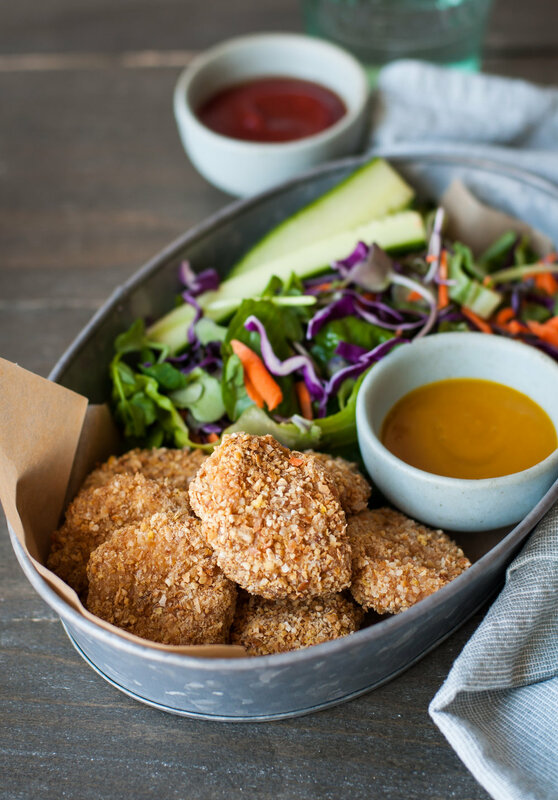 Once it is very hot, add about a tablespoon of your fat / oil of choice and immediately add 1/3 of the marinaded meat and begin stir-frying it. Don't dump it all in if you want to achieve a nice brown sear. Keep moving it around with a utensil until it is just cooked (do not overcook) and edges have browned, remove and set aside in the large bowl. Continue with the remaining 2 batches, adding more fat/oil as needed and adjusting the heat if it seems too hot. Set aside. 5. If you haven't in step 3, dial the heat down to medium. Add a bit more fat/oil to the pan and stir-fry the diced carrots with a sprinkle of kosher salt until tender to bite, about 3-5 minutes. Add cooked carrots to the bowl holding the browned steak slices. 6. Make sure your eggs are whisked and seasoned with 1/4 tsp salt. Next, add a generous tablespoon of fat / oil along with the sliced fresh ginger pieces and move them around. Add most (reserving some raw for garnish) of the sliced scallions and continue to stir fry another 10-15 seconds until the scallions are softened but still bright green. Pull out the ginger slices and discard - they have served their purpose in flavoring the scallion oil. Immediately add the whisked eggs. Keep moving the eggs around until they are just barely cooked through but still with a touch of runniness. They will cook further as they rest and also in the final step. Add the eggs into the bowl holding the carrots and sliced steak. 7. Keeping the heat on medium, add the cauliflower rice along with about 1/2 tsp kosher salt and allow it to essentially steam, moving it around occasionally for even cooking. Stay close and watch. Cook the cauliflower rice for around 5 minutes or until tender but not mushy. You definitely do not want to overcook it to the point of mushiness! Add back the steak slices, carrots and scallion eggs. Give everything a big stir to combine well. Taste for saltiness. I usually add about 2 tablespoons of tamari and sprinkle additional salt at this step, based on taste. Once everything is heated through again, take it off heat and drizzle with sesame oil. Serve immediately, garnished with raw scallion slices. SO GOOD!